Yeni FZ5, bir Akıllı Kameranın faydalarını ve güçlü bir Görüntü Sistemini tek bir platformda birleştirir. Akıllı bir kamera kullanılarak elde edilen benzersiz görüntü netliği, basit kurulum, hızlı montaj ve gelişmiş optik performans sağlar. FZ5, FQ serisi sensörlerden akıllı kamera teknolojisini destekler. Bu, başka optikler ve aydınlatma olmadan, kameranın makineye hızlı ve kolay bir şekilde takılmasına imkan verir. Kristal netliğinde görüntüler, yüksek güçlü aydınlatma ve parlamayı ortadan kaldıran polarizasyon filtresi kullanılarak kolayca yakalanabilir. FZ5 tarafından, örneğin boyut ölçümleri, çeşitli arama öğeleri (kalıp, kontur), kusurlar, kenar ve sayma aletleri gibi 70’den fazla işleme öğesi sağlanmaktadır. Bu işleme öğeleri, dallar ve döngüler sunan bir akış programında birleştirilebilir. Bu, kompakt görüntü sensörleri için esneklikte yeni bir boyut sunar. Fabrika otomasyonu veri ağ iletişimi için küresel bir standart olan EtherNet/IP, bir üretim hattına ya da makineye kusursuz entegrasyon için desteklenmektedir. Bu, kullanıcıların, herhangi bir üreticiden EtherNet/IP’nin etkin olduğu herhangi bir cihaza kolayca bağlanmasına imkan verir. Bunun dışında TCP/IP, seri ve paralel arabirimler aracılığıyla iletişim mümkündür. Note: Refer to the FZ5 Series Data sheet (Cat. No. Q203) for Ratings, Specifications and Accessories. Note: Select the Camera Cables between the Controller and Extension Unit, between the Extension Units, and between the Extension Unit and Camera according to the connected Camera. Different types or lengths of Camera Cables can be used for (1), (2), and (3) as well as for (4), (5), and (6). However, the type and length of Camera Cable (1) must be the same as those of Camera Cable (4), (2) must be the same as (5), and (3) must be the same as (6). A video signal cable and an operation signal cable are required to connect the Touch Panel Monitor. Use Straight or cross STP (shielded twisted-pair) cable of category 5 or higher for EtherNet/IP. SWCC Showa Cable Systems Co. 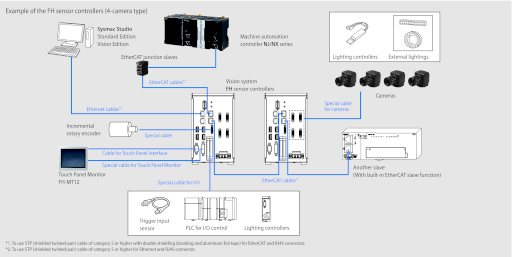 The Sysmac Studio is the software that provides an integrated environment for setting, programming, debugging and maintenance of machine automation controllers including the NJ/NX Series, EtherCat Slave, and the HMI. Sysmac Studio Vision Edition is a limited license that provides selected functions required for FH-series/FQ-M-series vision sensor settings. Note: 1. Site licenses are available for users who will run Sysmac Studio on multiple computers. Ask your OMRON sales representative for details. 2. Sysmac Studio version 1.07 or higher supports the FH series. Sysmac Studio does not support the FZ5 series. Software components that provide a development environment to further customize the standard controller features of the FH Series. Note 1. Fixing the lens or other reinforcement may be required depending on the installation angle or operating environment (vibration/shock). When fixing the lens, insulate the lens from the fixture. 2. The above specifications are values calculated from the optical design and can vary depending on installation conditions. Can be connected to all cameras. Please refer to the chart below. Create series of processing steps by editing the flowchart (Help messages provided). Either an NPN or PNP output is supported (switchable). SDHC card of Class4 or higher rating is recommended. Shutter speeds can be set from 20 μs to 100 ms.
Shutter speeds can be set from 25 μ s to 100 ms.
Shutter speeds can be set from 60 μ s to 100 ms. Note: FH Series Sensor Controllers version 5.32 or higher is required. It cannot be used in FZ series. Note: When you connect a LCD Monitor FZ-M08 to FH sensor controller, please use it in combination with a DVI-I -RGB Conversion Connector FH-VMRGB. Depends on the specifications of the EtherCAT master. 56 to 280 bytes/line (including input data, status, and unused areas) Up to 8 lines can be set. 28 bytes/line (including output data and unused areas) Up to 8 lines can be set. Supported by version 1.10.80 or higher. Supported by version 1.10 or higher. Supported by version 1.07.43 or higher. Supported by version 1.07 or higher. Not supported by version 1.06 or lower. Lit while power is ON. Lit when an error has occurred. Lit while the controller is in Measurement Mode. Lit while the memory is accessed. Lit while power is supplied to the SD card and the card is usable. Blinks while the SD memory card is accessed. Lit while EtherCAT communications are usable. Lit when connected with an EtherCAT device, and blinks while performing communications. Lit when EtherCAT communications have become abnormal. Lit while EtherNet communications are usable. Lit when connected with an EtherNet device, and blinks while performing communications. Lit when EtherNet communications are usable. Install the SD memory card. Do not plug or unplug the SD card during measurement operation. Otherwise measurement time may be affected or data may be destroyed. Connect a USB device. Do not plug or unplug it during measurement operation. Connect an external device such as a programmable controller. Connect the controller to external devices such as a sync sensor and PLC. Used to set a node address (00 to 99) as an EtherCAT communication device. Connect the opposed EtherCAT device. Connect a DC power supply. Wire the controller independently on other devices. Wire the ground line. Be sure to ground the controller alone. Perform wiring using the attached power supply connector. Lit while the controller is in Run Mode. Connect a DC power supply. Wire the power supply unit independently of other devices. After wiring, replace the terminal cover. Connect an external device such as a personal computer or PLC. Connect a track ball, mouse and USB memory. A total of four USB ports are provided and any of them can be used. However, when connecting two or more USB memories, do not connect them to adjacent ports. Doing so may cause the USB memories to come into contact, resulting in malfunction or damage. Connect the controller to a personal computer.